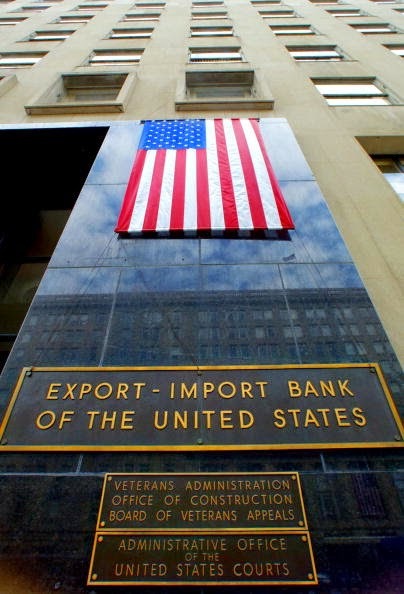 In less than two months the United States Congress must make a decision on the fate of the Export-Import Bank, an independent federal agency designed to provide export financing when private banks are not able. The satellite industry around the world stands out as the quickest-growing market the bank supports, which makes this decision pivotal for satellite as a whole. In one of her last interviews as president of the Satellite Industry Association (SIA), Patricia Cooper spoke to Via Satellite about the importance of the Ex-Im bank for the industry. “We call it an increasingly critical element in U.S. companies winning satellite business, particularly given that there is such an increase in brand new satellite operators. More than 12 new countries in the last five years have become satellite operators, so while export credit financing may be helpful for traditional or fleet-based operators, there are a lot of new entrants to the business, and it’s a high upfront and fixed cost business. Securing the credit for such a costly up front project is a significant factor,” said Cooper. Credit financing is one of many factors satellite operators consider when making a purchase. Without the Ex-Im bank, U.S. manufacturers would have to do their best to offer comparable terms to foreign competitors that have government-supported export credit agencies. According to the SIA’s “State of the Satellite Industry Report,” approximately 68 percent of the $15.7 billion global satellite manufacturing revenues in 2013 came from U.S. companies. Without the bank, satellite operator decision-making on new purchases is likely to change. “The concern is it would distort decision making for buyers. They would no longer be looking at an even playing field where manufacturers from all of the global providers would have comparable [financing] packages. Instead they would be looking at financing as one of the lead items rather than one of the many factors they might consider,” said Cooper. The Ex-Im bank has supported numerous satellite projects for SSL, Boeing, Lockheed Martin, Orbital Sciences and others. SpaceX too has received considerable support, including a 105.4 million loan to launch the Amos 6 satellite for Israeli satellite operator Spacecom. Without the bank, more deals may go to other foreign manufacturers and launch providers in the future. Neale described the Ex-Im bank as a “critical competitive need.” Russia’s Export Insurance Agency of Russia (EXIAR) and France’s French Insurance Company for Foreign Trade (COFACE for its name in French) both support satellite projects in their respective economies. The decision to reauthorize the bank, should Congress do so, is seen as a move that would maintain a more level playing field for U.S. companies. “The concern is that international buyers, particularly [with] private financing on their own, would either not be able to buy satellites or they’d be directed by the absence of credit financing in the U.S. to buy non-U.S. spacecraft,” said Cooper. On July 15, governors from 31 states sent a signed letter to John Boehner, R-Ohio, Harry Reid, D-Nev., Nancy Pelosi, D-Calif., and Mitch McConnell, R-Ky., urging them to prevent the bank’s charter from expiring this year. Congress is currently on summer recess, pushing the decision even closer to the edge. Without authorization, the 80-year old bank’s charter will expire on Sept. 30. Used to be, Mercer’s ice cream wasn’t found far from the 60-year-old dairy in Boonville, a town of about 4,500 in central New York. Now Mercer’s Dairy owners Ruth Mignerey and Roxaina Hurlburt and their 25 employees ship specialtywine-infused ice cream in a half-dozen flavors, including Cherry Merlot and Riesling, to 14 nationsincluding China, Indonesia, the Netherlands, Seychelles and Trinidad and Tobago. The product was conceived at a 2005 event sponsored by then-U.S. Senator Hillary Clinton and sales began two years later. Exports started in 2008 and now account for about a quarter of annual sales of more than $1 million. Employment is up from 20 four years ago. Foreign sales by small companies like Mercer’s are becoming a focus for economic development officials in upstate New York and other U.S. regions who are seeking a bigger slice of record exports to boost growth. Shipments abroad by businesses with fewer than 500 employees accounted for 32.9 percent of the U.S. total in 2012, up from 29.2 percent in 2005, according to Census Bureau data. Continuing to move the needle means persuading more such companies that it’s possible to sell outside of the country. President Barack Obama, who pledged in his 2010 State of the Union speech to double exports in five years, created the National Export Initiative, in part to help small businesses sell abroad. U.S. exports rose last year to a fourth-straight record of $2.28 trillion, increasing by almost $700 billion from 2009 to account for 13.5 percent of the $16.8 trillion gross domestic product, according to Commerce Department data. Selling goods and services abroad supports 11.3 million jobs, the datashow. She works to alleviate all three from the Export Assistance Center in lower Manhattan, one of about 100 regional centers around the country. The office (called USEAC, which stands for US Export Assistance Center sic) also is home to other federal agencies that assist with exports(among them US Commercial Service and the Export Import Bank of the United States – US ExIm, the main Agency which finances and insures exports for large and small business exporters sic), making it a kind of one-stop shop. Yeazel used Commerce’s Gold Key Service, which gives firms market research and arranges meetings with buyers on visits to the country. Trips cost $700 for small companies like Frigid Fluid, which has 17 employees; first-time users pay half price. Commerce Department specialists in 80 countries plan trips, attend meetings, and provide translators. Exports of products like embalming fluid and casket-lowering devices have grown to make up 34 percent of Frigid Fluid’s $4 million in annual sales, he said. Caroline Freund, a senior fellow at the Peterson Institute for International Economics in Washington, calls Obama’s initiative focusing on small firms misguided and impractical, given the export dominance of bigger companies such as Chicago-based Boeing Co., the largest U.S. exporter. Yet boosting exports is the missing piece of the full-fledged recovery in the U.S. economy, according to Ludovic Subran, chief economist at Euler Hermes Group. The Paris-based credit insurer pays companies if foreign customers don’t, tracking risk through 1,500 underwriters. At Mercer’s, Mignerey is working to expand in new markets, including Australia, Kenya, Puerto Rico,South Africa, South Korea, the U.K., Philippines and Suriname. Classification makes approval complicated because some jurisdictions call its wine ice cream food, others label it alcohol. Packaging needs vary. Foreign sales help take the seasonality out of the ice cream business. In the production facility, four employees work year-round where previously winter staffing fell to two full-time and one part-time. In the office, four workers help with export-related administration, up from two. The Export-Import Bank of the United States (“EXIM”) is in the midst of a reauthorization battle. Whether or not EXIM gets reauthorized depends entirely on Congressional votes. Unfortunately, there are a significant number of vocal, powerful Congressional members who are seeking to shut the Bank. We ask readers to help reauthorize EXIM by engaging with elected officials and industry groups. Our collective voices need to be heard so Congress can be best informed as they prepare to vote on this critical issue. Below are online petitions for the reauthorization EXIM. They take just a few moments to complete. Additionally, you can email your local Congressman/Congresswoman and Senators to let them know you support EXIM. We encourage you to write a short note asking for their vote to reauthorize EXIM. To find your Representative, click here and type your zip code. To find your Senator, click here, then navigate to their web page and write a quick note. Why is there such a challenge to EXIM’s existence? According to EXIM’s website, it has supported more than 1.2 million private sector jobs and has generated >USD 2 billion for US taxpayers since 2009. Nevertheless, many Congressional Conservatives and Tea Party activists consider EXIM to engage in corporate welfare due to loans supporting large exporters. While EXIM certainly finances the export of large capital goods, last year nearly 90% of transactions supported American small businesses. And what if EXIM did not exist? 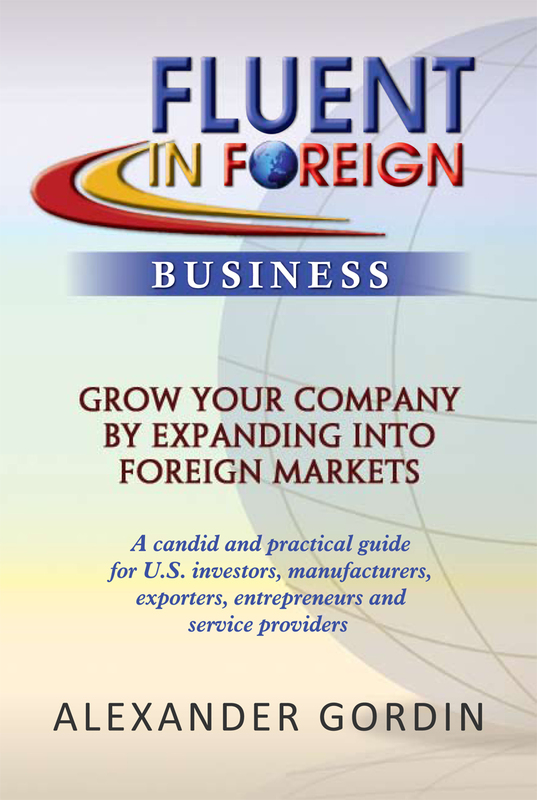 American companies will be at a competitive exporting disadvantage to exporters in 59 other major exporting countries that have active export credit agencies. Republican Rep. Tom Reed states, “To unilaterally kill the Export-Import Bank would be a huge hit the the competitiveness of American companies.” Republican Rep. Chris Collins seconds the opinion, “This isn’t a government handout.” Jay Timmons, CEO of NAM articulates the competitive need for EXIM, “Our trading partners have larger export credit agencies and are growing them to boost their exports much more than the United States.” The closing of EXIM would negatively impact the US economy; lost sales, lost jobs, lost tax dollars. Please do your part and help save EXIM. Thank you. WASHINGTON—The U.S. trade deficit narrowed more than expected in June amid a sharp decline in imports, a development that is likely to boost economic-growth readings but raises a concern about domestic demand. The U.S. trade deficit shrank 7% to a seasonally adjusted $41.54 billion in June from May, the Commerce Department said Wednesday. That was the fastest contraction in the gap since November. Imports fell 1.2% in June, the steepest decline in a year, while exports increased 0.1% to reach a record high. The smaller gap than projected has many economists expecting the government to upgrade its measure of second-quarter gross domestic product later this month. The trade deficit has shrunk about 6% since March; a narrower trade deficit generally supports economic growth. Forecasting firm Macroeconomic Advisers now projects GDP, the broadest measure of goods and services produced across the economy, expanded at 4.2% rate in the quarter. Other economists project as high as a 4.5% gain. Last week, the Commerce Department said second-quarter GDP expanded at 4.0% annual pace. But the trend isn’t entirely positive. It suggests importers may not be confident that U.S. consumers will ramp up spending in the second half. That runs counter to the Commerce Department’s measure of consumer spending, which increased steadily during the second quarter. The June decline in imports was led by decreased U.S. demand for consumer goods, cars and car parts, and foreign oil. “The broad-based declines in import activity seem at odds with the narrative of improving domestic demand,” said TD Securities economist Millan Mulraine. Growth in consumer spending eased in the first quarter and exports fell, contributing to the economy contracting at a 2.1% rate. Those factors reversed in the second quarter, supporting the rebound in growth. Exports rose sharply in May and held those gains in June. The small June improvement was led by increased foreign demand for U.S. cars, consumer goods and services, which include travel and intellectual-property use. The numbers coincide with improved growth in China this spring and a stabilizing European economy. However, unrest in the Mideast, Africa and Ukraine could pose headwinds to global trade. The U.S. trade ledger with Russia fell in June amid an escalating sanctions battle over the conflict in Ukraine. Exports plummeted 34% on the month to the lowest level since January last year. Imports from Russia fell nearly 10%. Russia, however, accounts for a relatively small share of total U.S. trade. Trade with China, the No. 2 U.S. partner, has expanded modestly this year. The U.S. trade gap for goods with China widened 4.9% through June, compared with the same period a year earlier. That is only slightly larger than the 4% overall growth in the goods-trade deficit. The goods deficit with European Union expanded 15.2% in the first half. 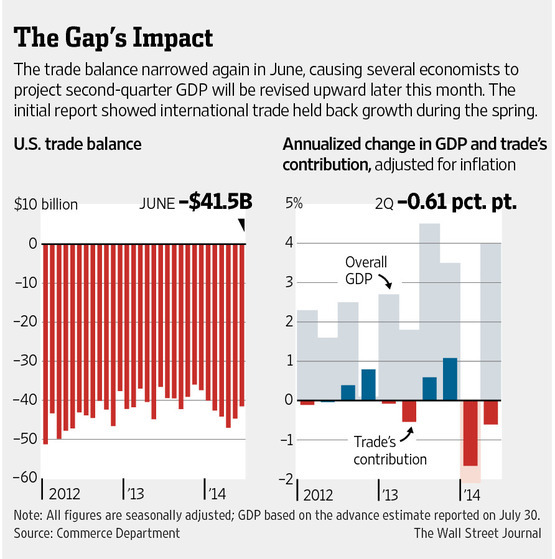 The gap with Canada, the largest U.S. trading partner, widened this year. But the gap with Mexico, Japan and Brazil narrowed during the first six months of 2014. —Ian Talley contributed to this article. Financing large complex export projects and transactions through Export Credit Agencies, such as the US Ex-Im Bank, is difficult at best and impossible at worst. Hundreds of moving parts, byzantine structures, political considerations, legal quagmire, shipping and logistics challenges, along with financial considerations, extensive due diligence, host country laws, licensing and public relations are just a few of the factors involved in this year-plus long process. Add to that geopolitical risks a la Ukraine, Russia, or Iraq and the process can befuddle even the most sophisticated practitioners. Thus it is vital to have a highly experienced team of financiers, lawyers, shippers, technical specialists and ECA compliance folks to work with committed exporters and buyers in order to develop and nurture such transactions to success. Yet oftentimes in their desire to either save money, or driven by false sense of familiarity with the process, the exporter clients prefer to undertake what I call a “home depot” do-it-yourself approach to ECA financing. During times of relative geopolitical normalcy this approach primarily works for those companies that have extensive experience dealing with ECAs in structuring complex export transactions. During times of political instability such approach is certainly doomed for all novices . Although there are multiple players in the export finance industry and they range from the largest global banks, law firms and shipping companies, to small brokerage firms and advisors of different stripes; the world of export finance is fairly small with all players of substance knowing each other well and for many years. 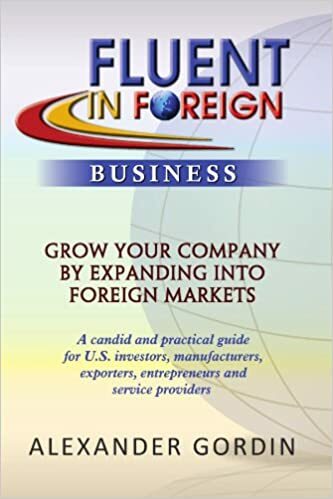 For a newcomer exporter venturing into this world, the complexity of the process and the capabilities of the players are not well-known and oftentimes they are misled and misguided. Thus after taking a hard look in the mirror and forgoing a do-it-yourself approach to complex export financing, the next step any company should take is to really understand the workings of the export finance industry, capabilities of the players, and the importance of an integrated approach of putting together a complete finance, legal, compliance and logistics team early on. Selection of the financial advisor should not be based on the name alone, but on that advisor’s experience in the target market to be served by the exporter, his or her experience in handling complex transactions and the ability to add value to the process. Good advisors will oftentimes save the exporter such large sums during the structuring and implementation of the process, that their fees pale in comparison. 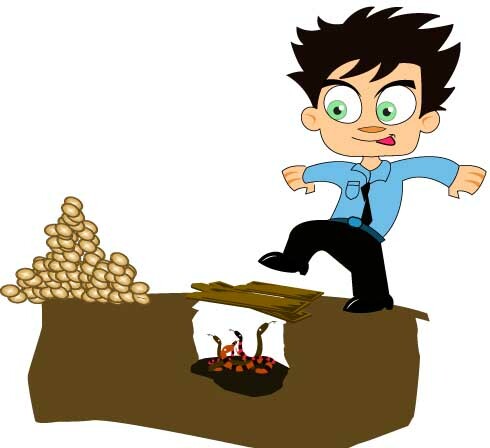 Once the advisor is selected, the exporter should let him or her invite the other team players into the process. 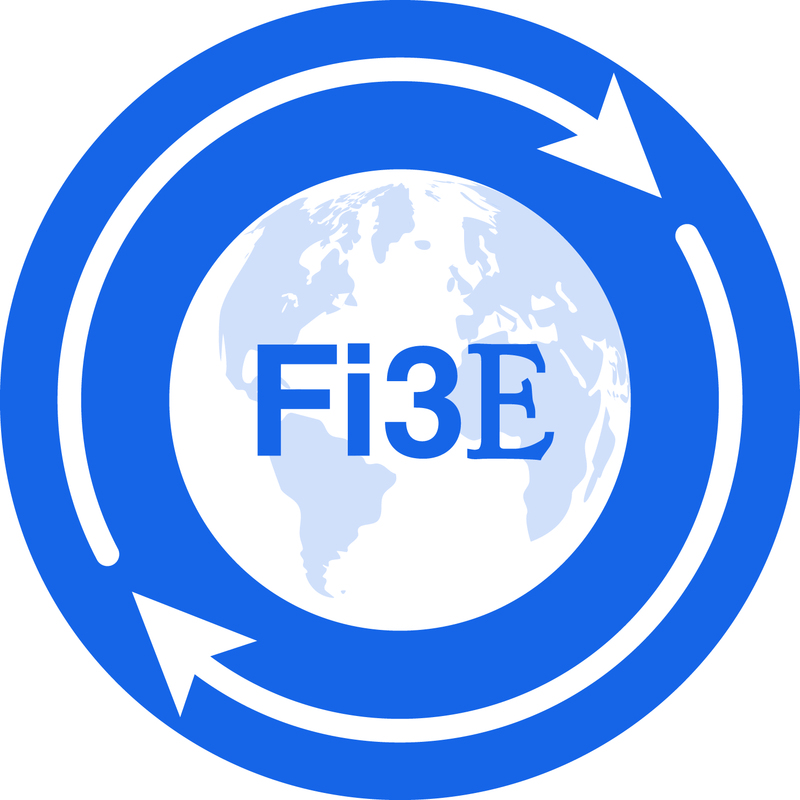 There is a big difference between the exporter being totally committed to the process and working very hard to assist the advisors by supplying the needed information in the timely manner, helping to obtain necessary licenses, interfacing with the buyer etc and having the exporter venture into the process on his/her own. The first approach will lead to the successful financing and the latter will certainly lead to a painful and expensive failure. A tanker of oil from Texas set sail for South Korea late Wednesday night, the first unrestricted sale of unrefined American oil since the 1970s. How that $40 million shipment avoided the nearly four-decade ban on exporting U.S. crude is a tale involving two determined energy companies, loophole-seeking lawyers, and an unprecedented boom in American drilling that could create a glut of ultralight oil. The Singapore-flagged BW Zambesi is the first of many ships likely to carry U.S. oil abroad under a new interpretation of the federal law that bars most sales of American oil overseas. Analysts say future exports appear wide open: as much as 800,000 barrels a day come from just one of the many U.S. oil fields pumping light oil. Under rules Congress imposed after the Arab oil embargo of the 1970s, companies can export refined fuels like gasoline and diesel but not oil itself except in limited circumstances that require a special license. Such licenses, often for oil destined for Canada, are issued by the Bureau of Industry and Security, the unit inside the U.S. Commerce Department. Until recently, domestic oil production had been declining and exporting oil wasn’t a hot issue. All that changed as new techniques for tapping oil from shale formations have sparked an oil boom in Texas, North Dakota and elsewhere. Since the end of 2011, U.S. oil production has jumped by about 48%, to about 8.4 million barrels a day, according federal data. That has been good news for companies including Enterprise Products PartnersEPD -2.90% LP in Houston, a $47.7 billion company that processes, ships and stores oil and gas. Last summer, the company noticed a troubling trend: ultralight oil flowing from South Texas was flooding the market and pushing down prices. It predicted volumes would swell and prices could fall further as oil companies ramped up drilling and production. Energy companies and lobbyists had started advocating for ending or at least relaxing the ban; Exxon Mobil Corp. XOM -4.17% , the nation’s biggest oil company, openly supported lifting export restrictions in December. But neither Congress nor the Obama administration appeared willing to do more than study a change, which some lawmakers fear would result in higher gasoline prices in the U.S. The industry embarked on a subtle, behind-the-scenes review of the regulations, discovering an opening for exports under existing definitions of the law. Enterprise and its lawyers found language that they believed would allow them to argue that the processing to remove some volatile elements from oil would be enough to make the resulting petroleum qualify as exportable fuel, even though it is a far cry from the traditional refining process. The processing, which peels off fuels like propane and butane, is commonly done in oil fields across the U.S. Companies that manufacture the equipment involved say it costs between $500,000 and $5 million, a fraction of the expense of building a refinery. When Enterprise made its case to the government, it said the equipment that its customers use to treat oil for shipment on its pipelines chemically alters the condensate in a way that makes it an exportable fuel. However, several industry executives say the equipment is not special. “Early this year, we became very confident, extremely confident, that this was indeed a petroleum product that could be exported,” Bill Ordemann, a senior vice president at Enterprise, said in an interview. In late February, Enterprise representatives gave a private presentation to Commerce Department officials and answered a battery of questions. Oil executives who have met with Commerce say five to 10 department officials are involved in the talks and decisions on export rulings. When energy companies began to plead their cases with the department in earnest, an official asked one company representative how to spell condensate, said a person at the meeting. “I look for practical solutions. I looked over the regulations, said, ‘What is my client trying to do, what windows do we have?’ ” said Jacob Dweck, a partner at Sutherland Asbill & Brennan LLP hired by Enterprise to press its case. Pioneer Natural Resources Co. PXD -2.49% executives also were looking for a way around the ban. Pioneer, which drills across Texas, hired a former deputy secretary of the Commerce Department to represent it. Ted Kassinger, a partner at law firm O’Melveny & Myers, zeroed in on existing oil field equipment and asked whether it might meet federal regulatory criteria. “We suddenly realized we had existing infrastructure that, at least in part, goes through a distillation process and is producing a product that’s not crude oil,” he said. Jeff Navin, a partner at Washington, D.C.-based policy consultants Boundary Stone Partners, said that the final decisions rested on specific language in the export ban that didn’t define a refined product but rather said oil had to pass through a “distillation tower,” traditionally found at refineries, before it could be exported. Commerce gave Enterprise the green light for exports at the end of March and Pioneer received its ruling soon after. Both companies said their applications weren’t coordinated. The decisions mean unrefined ultralight oil can now be exported from the U.S. in some cases, because the processed condensate that comes from field-level equipment is considered chemically altered enough to skirt the ban. The White House was caught off guard by the news of the department’s actions, which weren’t coordinated with other parts of the administration, according to senior White House counselor John Podesta. Pioneer said its ruling is narrowly drawn to fit its own operations. But Enterprise said its ruling isn’t specific to its own operations or processing equipment. Any company that processes condensate in a manner that adheres to Commerce’s ruling can sell it to Enterprise for export, the company said. As many as 10 other companies have since applied for their own rulings on oil exports, according to people familiar with the matter. All those requests are on hold for now. The 400,000 barrel shipment leaving the U.S. from Enterprise’s terminal in Texas City, south of Houston, was purchased by GS Caltex Corp., a South Korean refiner. 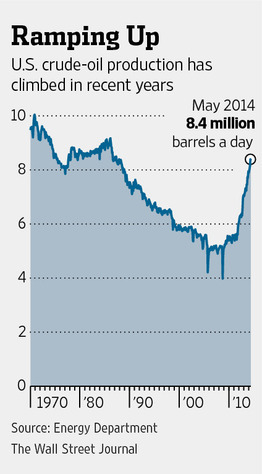 Oil traders and executives say negotiations are already under way for additional sales to Asian buyers. — Amy Harder, Eric Yep and Alison Sider contributed to this article.